I have read many of these self-development books and every time I read one I always felt that there were something missing in them. 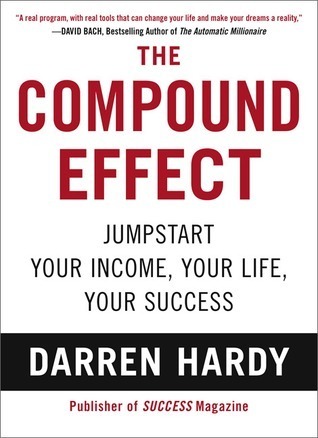 The Compound Effect is the first book that I really felt nailed the whole process from explaining where we usually do wrong, what we can do to overcome it and what we can do to make it a habit. Darren Hardy also managed to give very good examples and metaphors on the different topics that he is writing about. The one weak part of the book would be the conclusion where I feel that he did not manage to pull it together and it felt a bit rushed. I would have loved to get a more solid conclusion with highlights from the previous chapters. The reason why I still think the books pulls off a 5 star is because it is short (160 pages) and you could say that the whole book is a summary of life lessons in a well-written format with some great exercises included. Sign into Goodreads to see if any of your friends have read The Compound Effect.